But what seems a very short back swing is actually very leveraged, and so, if I am even close to being correct on my personal “leverage niche,” which I’ve confirmed in theory with my SwingRite work this past week… you’re going to see a very different MCS Golf Swing from yours truly than what you’ve been used to over the years. I’ve been buzzing around it, as I was last winter with my postings, but the thing is that you can do something very well at times and still struggle to replicate what you’re doing if your understanding of what you’re doing is not full. Meaning, the reason most people use visual concepts or swing thoughts is because they can only replicate the action they want in that way. Of course, once you understand fully the process of what you’re doing, and I mean more than just making a proper pivot and arm action, etc. – you can do it exactly the same way every time. 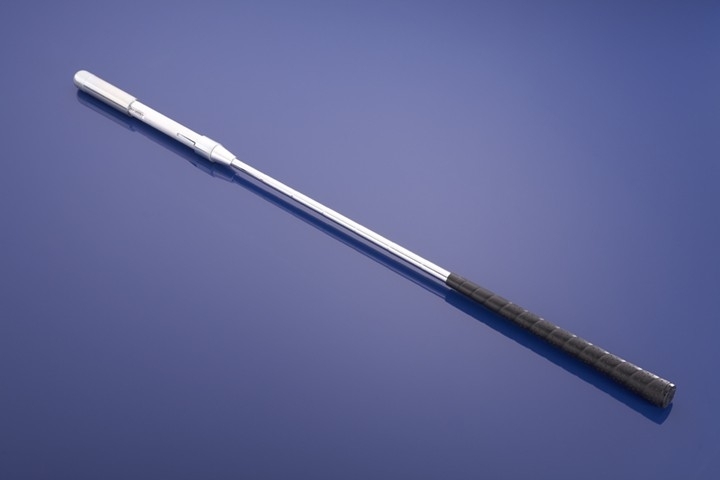 And when it comes to competition, that means you can make the action unconscious and exactly replicated every time, which makes the nature of playing the game or swinging the club in long drive that much easier. That makes the post title a little misleading, because I actually found it nearly a year ago – but I only had a visual concept of how I was doing it, a “feel,” if you will, and it would come and go, until I figured it out to make it repeatable – where last year, I would say I wanted at least 3 consecutive “clicks” with the SwingRite when I was working out, I can now replicate the same action producing that same optimal leverage and the awesome speed it brings, every time. And know what, where and why about it. So, more on this concept of “Big Legs, Little Arms” in the coming months. … I think I just ensured that it will be, for myself and a good deal of other WAX Nation MCS swingers! Thanks for the prompt response.You apparently agree. Bobby uses the same two photos. 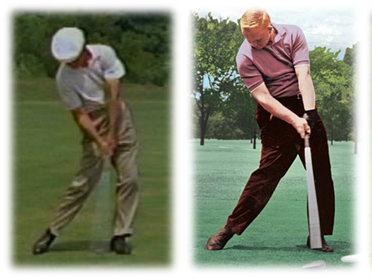 Welcome RH – I use that pic and have used it since 2014 when I made the right-bias and spine tilt an integral part of my MCS swing model theory. 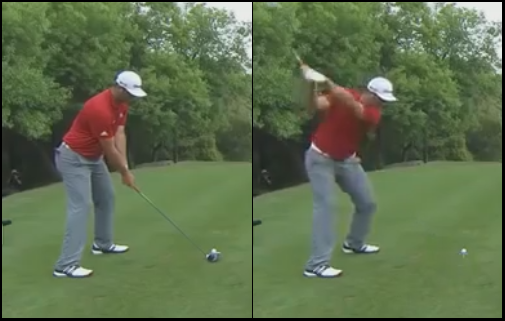 I could use any impact pic from a proper swing model, but people like to argue. Not much upon which to elaborate, Tom – it happens naturally and yes, you will hurt your back trying deliberately to twist the spine. Or at least there is a high degree of risk in it. I don’t know who this “BL” is, forgive me. Focus on the hips & legs and what separation that does occur in the thoracic region will occur on its own. maybe I should elaborate; I was trying to get the separation on my downswing by holding my head and chest back facing 2 o’clock while dropping my arms on the DSW. That hurt a lot. Let me assure you that you don’t have to do anything special to get the separation – you have it already if you’re making a back swing, and the pain came from trying to get more. I bring it up merely to illustrate how little turn you can get properly. Any more, especially with effort, is dangerous – I wouldn’t advise continuing that course of action! The problem could be what you consider to be a “bigger” hip turn. What you need is “enough,” and you probably had it. If you’re achieving a full shoulder turn, then you have enough. The problem is most modern planted swingers can’t get a full shoulder turn naturally with that method so they twist the back to get there. If you’re turning the hips freely and you’re getting a full shoulder turn, that’s all you want be doing. No more, no less. You’ve likely gone a little too far in seeking something and need to come back. Bottom line, don’t do anything that makes your back hurt, either on the back or down swing! ok, thanks for your additional comments. I like to experiment at the range. But I probably should have stopped where I was because I was very consistent for a while there recently. But my swing does not look like a pros yet so I am still trying to tweak to so it is smoother because in my mind smoother should be more powerful and repeatable. I think I’ll just go back the swing rite and your drills, that should fix me. It’s been a while since I’ve seen it… I wouldn’t mind taking a look if you wish.